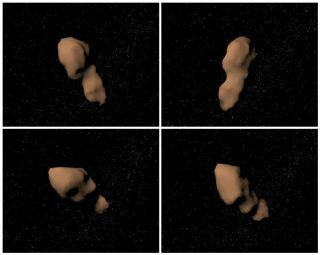 Computer-generated views of asteroid 4179 Toutatis, constructed using radar observations from NASA's Goldstone Observatory in California. A giant asteroid will make a flyby of Earth over the next few days, and armchair astronomers can watch the action live on their computers. The near-Earth asteroid 4179 Toutatis, which is about 3 miles (5 kilometers) wide, will zoom within 4.3 million miles (7 million kilometers) of Earth during its closest approach early Wednesday morning (Dec. 12). That's too far away to pose any impact threat on this pass, but close enough to put on a pretty good show through top-notch telescopes, researchers say. And some of those scopes will be tracking Toutatis' movements for the benefit of skywatchers around the world. The online Slooh Space Camera and Virtual Telescope Project, for example, will both stream live, free footage of the asteroid from professional-quality observatories. Slooh will webcast Toutatis views from a scope in the Canary Islands off the west coast of Africa beginning at 3 p.m. EST (2000 GMT) today (Dec. 11). Another show will follow at 10 p.m. EST tonight (0300 GMT Wednesday), with footage from an instrument in Arizona. You can watch them here at SPACE.com (see embedded webcast below) or at Slooh's website: http://www.slooh.com. "Slooh technical staff will let the public follow this fast-moving asteroid in two different ways. In one view, the background stars will be tracked at their own rate and the asteroid will appear as an obvious streak or a moving time-lapse dot across the starry field," Berman said in a statement. "In a second view, Toutatis itself will be tracked and held steady as a tiny pointlike object, while Earth's spin makes the background stars whiz by as streaks," Berman added. "Both methods will make the asteroid's speedy orbital motion obvious as it passes us in space." Meanwhile, the Virtual Telescope Project — which is run by Gianluca Masi of Bellatrix Astronomical Observatory in Italy — will offer its own free webcast Thursday (Dec. 13) at 3 p.m. EST (2000 GMT), complete with commentary from astrophysicists. Asteroid Toutatis was first viewed in 1934, then officially discovered in 1989. It makes one trip around the sun every four years. The Minor Planet Center in Cambridge, Mass., lists Toutatis as a potentially hazardous object, meaning that it could pose a threat to our planet at some point in the future. The current flyby is no cause for concern, however. At its closest approach, which comes at 1:40 a.m. (0640 GMT) Wednesday, Toutatis will still be 18 times farther away from Earth than the moon is. Toutatis would cause catastrophic damage if it ever did slam into Earth. In general, scientists think a strike by anything at least 0.6 miles (1 km) wide could have global consequences, most likely by altering the world's climate for many years to come. For comparison, the asteroid thought to have wiped out the dinosaurs 65 million years ago was an estimated 6 miles (10 km) across.